Combining our in-house geographical datasets and renderers with industry-standard 3D software enables us to produce diagrams and cross-sections with a striking level of realism and clarity. 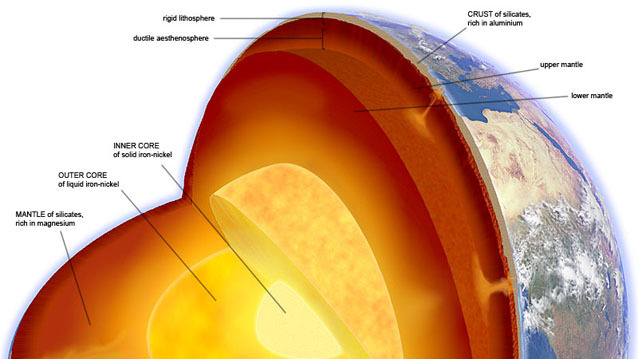 This example shows, to correct scale, the major zones of the Earth's interior, with visual effects such as the mantle hotspots linked to actual surface features such as volcanic peaks. This artwork was built up from twelve individual layers rendered by three different graphics packages, including sections through the interior zones, the crust and the atmosphere, and shadows dropped from the cloud layer.